With the Greater Washington Region American Heart Association‘s annual Heart Ball right around the corner, WashingtonExec spoke with event Co-Chairs David Humpton, executive vice president of Montgomery Village Foundation, and Barbara Humpton, CEO of Siemens Government Technologies. In celebration of this year’s theme—“Heart of the Community”—the event will be hosted Feb. 25, 2017, at the Mandarin Oriental Hotel. This black-tie event historically draws more than 500 of the area’s most prominent medical, corporate and community leaders. WashingtonExec: Can you tell us a little about yourself and why it’s important for you to be involved in the American Heart Association? 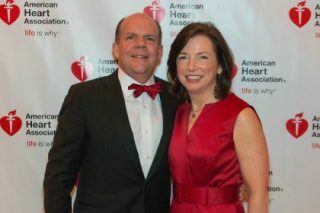 David Humpton: I got involved with AHA because of, quite honestly, my family being impacted directly by heart disease. I felt it was important, given that so many people, young and old, are affected by diseases that can be prevented, to support the AHA, which has a broad mission of education, prevention and funding considerable research in the Greater Washington area and throughout the nation. Barbara Humpton: I’ve seen that the government contracting community has been extremely engaged in supporting the AHA, and that’s where I first got involved. Getting involved in the Heart Walk, seeing the good work that was done and the camaraderie among the volunteers was a real inspiration. The AHA approached us and asked if we would lead one of the major activities and chair the Heart Ball. WashingtonExec: Can you summarize what the Open Your Heart Committee does for individuals in the community? Barbara Humpton: The Open Your Heart Campaign is done in conjunction with the Heart Ball, but we also do fundraising throughout the year by asking individuals to contribute to the cause. As in past years, there will be a special appeal for the Open Your Heart Campaign in the midst of the Heart Ball. It’s an opportunity for individuals to make a gift toward the mission. We are honoring a very special little girl this year and we cannot wait for everyone to meet her. AHA has invested over $4 billion in research about heart disease, second only to the federal government. These funds have led to numerous medical advances like the pacemaker, clot-busting drugs and the advent of CPR. Thirteen researchers funded by the AHA have won Nobel Prizes and, of course, many local institutions in the area also benefit from the research grants as well. The AHA is also devoted to educational programs and policy work, including advocating for change in laws and local practices, to helping promote healthy lifestyles. David Humpton: One legislative policy that impressed me was the initiative of the District government to require CPR training as a graduation requirement in high schools. Those kinds of initiatives are going to save lives. Early intervention before emergency personnel arrive has been proven, over and over again, to make a difference in saving the life of someone in a cardiac arrest. The AHA has implemented a new form of CPR, called hands-only CPR, that only involves chest compressions instead of mouth to mouth that is found be as effective, if not more, on adults. WashingtonExec: What are you most looking forward to at this year’s Heart Ball? David Humpton: I’m excited to see all the people we’ve talked to in our outreach to support the Greater Washington AHA initiatives. It really is a culmination celebration of the year, and it’s a really fun event. There’s a silent auction, a live auction, a fantastic dinner and a survivor, our Face of Heart, who will share her story. It’s a story of success, and that’s what the AHA is striving for—success in building healthier lives free from cardiovascular disease and stroke. Barbara Humpton: It is a wonderful chance to say thank you to the community, and, like Dave, I also think that one of the most special things about the ball is meeting the “Face of Heart.” This year, we have little Rosemary, who was born with a congenital heart defect called Hypoplastic Left Heart Syndrome, and here she is as a 9-year-old thriving, thanks to the work of the AHA. She’ll be there to tell her story, and that will give us a chance to reflect on the importance of the AHA’s work in the community and the impact it has on each and every one of us. WashingtonExec: Is there anything you would like our readers to know about the American Heart Association? Barbara Humpton: The AHA also reaches out to young professionals with their efforts surrounding the PULSE organization, which is the young adult chapter of the AHA. The night of the Heart Ball, there will be an afterparty called “Heart After Dark,” and the young people come out in force. They have a great band, desserts, and the fun will continue after the ball ends. David Humpton: This year, PULSE raised between $50,000-$70,000 toward the Heart Ball fundraising goal. These are young professionals, and we’re very proud of that effort because they will become executives. It shows the future is bright for nonprofit giving, especially for the AHA, in the Greater Washington Region. A final thing that I would like to add is that one of the goals of our executive leadership team has been to broaden the number of participants on our team, and we reached that goal. But now we want to surpass that—we need more business leaders to come forward to participate and help support the mission of the AHA. We’re already looking forward to 2018 and beyond. It has been a wonderful experience to meet so many people and organizations dedicated to building a healthier future for our community and world.